An early meeting with the WW CEO of ZenithOptimedia to discuss how the market is shaping up and what can be expected of 2012. As the conference season starts I am being pulled in a number of directions to make sure everyone who needs the latest info has it! Later that morning a call with the boss, Curt Hecht, it’s a about planning stage and we discuss what we need to get done for 2012 and how we will work with the agencies. A lot of progress in 2011 for VivaKi and The VivaKi Nerve Center and so it makes for some great conversations for next year. More than ever we will be a very European organisation which is achievement in itself. a series of meetings with the major EMEA markets all to be planned. A session on contracts, which seems to take up a lot of time at the moment, but we are making real progress with a number of contracts signed that will help power The Pool, Partnerships and AOD. End the day back at the WW CEO’s office to finalise some notes for the conference and its my turn to start to prepare for the Exchangewire ATS event where I am on a panel with Nigel Gilbert from Orange, Gurman from MediaIQ, Breadon from AOL, Martin from infectious and hosted by Zuzanna at Microsoft. Will be a good day I am sure. In the evening, I went to the Appnexus / Microsoft drinks and met with the founder of Appnexus, the new head of Microsoft, Andy Hart and a number of others. Bumped into Jakob of GroupM, always a pleasure and we had a little catch up and then I had to leave for dinner with Quantcast and Exchangewire down at BerryBros. As usual you learn something on these nights and having spoken to a number of people from other groups, its clear to me that VivaKi are the most integrated and aligned group in this space, working hand and glove with the agencies. I hope over time this pays dividends for us all. Arriving at the event really makes you see how far things have moved on in the last year. Ciaran’s first one was a big event but this really surpassed itself with 400+ guests. 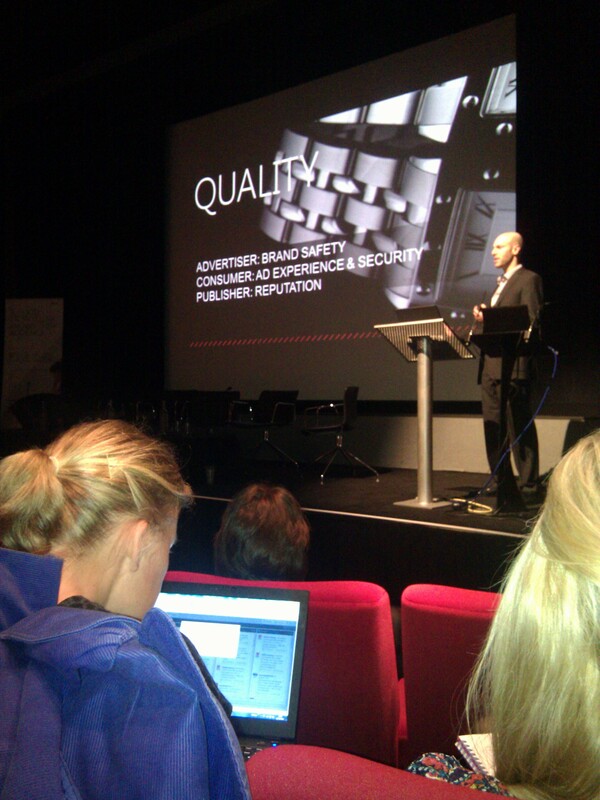 Unfortunately as the day went on it became clear that again it lacked publishers and advertisers. The more I think about this though, the more I think, why should they be there? Morning sessions were OK but lacked direction, more moderation, different questioners and less keynotes would have improved the morning session. Keynotes fund these events but I feel having Mediamath and Rubicon and Appnexus all doing a turn is perhaps excessive. Microsoft did a great session, slick presentation and I think surprised everyone, he even presented an Apple Ad, which was the talk of the Twittersphere.. The afternoon panel I was on was billed to be controversial, I knew it would not be, for two reasons. The first is we have said this before and the second is that people in the audience don’t want to stand out and make issues. The bigger these events become the more polite they will become. I had a couple of key themes I wanted to get across around the whole Ad Trading Desks. I made all of these statements as well as suggesting Ad Nets use client data across their campaigns and received no resistance so, if it was not controversial, it was not because of me! Feedback has been that it was too about positioning of each others company etc but you go where the questions take you. All in all though, a good day, got to catch up with some great people from around the business and generally enjoyed it all. We march on with an exciting morning meeting with a large European company that is soon to become Vivak’s first VNC Partner in EMEA. We have of course high profile relations with Microsoft and Google as well as other US companies, but this is the first at scale. We worked through the opportunities, what we need to do together and how we can help each other, a great start to Wednesday and we look forward to releasing that news soon. Later that day, I 100% focused on The Pool. We have been delayed on this but we are ready to go again, very exciting, there is other info on The Pool elsewhere on my blog Later this year I am presenting at the IAB conference on Spain the results of the Spanish Lane and some of the work that’s been going on in the US, I am really excited about the results that have come from this work. We have three great publisher partners and already two major clients so things are looking great in that regard, there will be more to come on that subject shortly. The day ends meeting a team of senior Google Product managers who are trying to work with us to provide insight to power Audience On Demand. It’s these meetings that the Google partnership is founded on, not media spend and discounts. It was a really interesting session and we learned alot about what is coming up. Invite will be a very powerful proposition. A quieter day on the meetings and valuable time to catch up. I did meet up with the CEO of Vindico and team who have big ambitions in the UK. We work with them on The Pool and they are a great outfit. Its time we need to get over the control issue around video adserving, we have been through this once with display and its time we moved on when it comes to video. We are used to substandard, early 2000 type tracking and reporting which is not acceptable. A chance to discuss everything we have been doing and seeing this week. 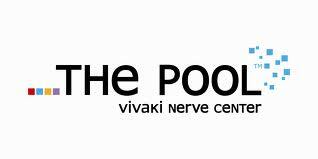 A morning appointment with a client with a brief to talk them through all the things The Vivaki Nerve Center are working on, went brilliantly and we will be doing some great work I hope. They showed the kind of interest in innovation that makes it all worth while. A run for the train from glamorous Slough with just enough time to read the placard under the stuffed dog at the station and down to Microsoft to present to their regional scale display teams and talk about the importance of agency trading desks. Quite a turn out and some great questions from the group, I hope we can act on some of the discussions and continue to grow our global partnership. I end the week with some time to keep up momentum with The Pool, discuss with thepaulsilver the final touches of an exciting launch next week and what I am going to do when he is on holiday! When I started in the Vivaki Nerve Center I had quite a few things on my to do list. One of the most exciting was getting ‘The Pool’ live. Video advertising is the subject of choice. Why is that? Well there are some fundamental factors that lead video to be an ideal Lane in any country. Firstly we all know its growing hugely, unstoppable and more and more quality content is migrating to the web which is not being followed by advertising pounds. That leads to the next couple of issues. The ability of publishers to monetise has been difficult due to the constant erosion of pricing and lack of research to prove it works and secondly it’s a chaotic ad market in terms of formats. If you work on the basis of 50-60% of TV ad pounds go against a 30sec Ad it’s easy to ramp up investment rapidly. Anyone who has done video advertising knows there are too many formats, too many creative approaches and publishers all have their own model. The Pool aims to solve that. Tomorrow sees the launch to all the major publishers in the UK of The Pool Lane 1 in the UK, Long form video. Vivaki Nerve Center with close collaboration from ZenithOptimedia and Starcom will be aiming to get publishers on board with the project to find the single best Ad format for video across a range of categories of results. Once on board we will work through field research and with the help of clients to identify the winning Ad format. It’s an exciting project and I hope very high profile, the end result should be a win for the publishers, a win for the advertisers and a win for the agencies in the Vivaki groupe. I hope by the end of this there will be a model that becomes second nature to planners and allows scalable spend in video which has to be a good thing. I will then be turning my spotlight on mobile. Mobile suffers similar issues if not worse and needs to have a greater industry focus put upon it. The levels of spend in mobile display are appalling when compared with the time spent on mobile devices so I hope in 2011 The Pool approach will drive some great new learnings for mobile. 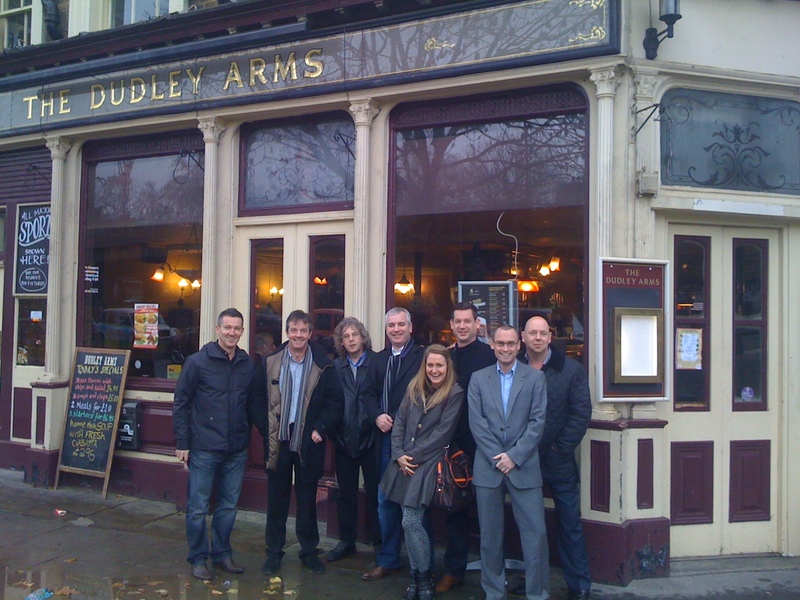 Yesterday saw a small reunion at The Dudley pub in Paddington. The Dudley was the spiritual drinking home of Zenith Media as it was. Yesterday some of its most loyal supporters returned to have a quick drink there before moving on to other Paddington favourite haunts. The reminiscing and story telling was in full swing and it was a great day but left you realising how much media has changed from the days back in the shed @ Paddington. ZO is now all grown up with shiny offices on Charlotte St, along with many other agencies in the area, many of our group had left ZO and interestingly often from agency to media owner which shows how much the skills between agency and media owner are blurring as they become more and more strategic in their approach as well as more central to discussions with clients as clients look to involve content and conversation in their approach to reaching people. All in all though, it was good to discuss some of the bigger issues which I would be prohibited from raising here but focused on JF and TS quite a bit and of course not to mention JH and KH.